The club has a new archivist in Hugh Miller and has expressed collective gratitude to the outgoing archivist, Euan Frew. Euan has done an immense job for the club manfully and manually archiving reports for over 25 years! As a measure of the scale of his endeavours the archive for the current year fills two substantial ring binders, nearly 500 pages and earlier years are filed in four heavy boxes. Euan has put sustained effort into creating a meticulous, professional record of the work of Ayr Rotary over the history of the club. These records are important and not something that should be hidden away. To improve visibility and access, Hugh, whose task is almost as great, has already made significant progress in digitising past records and setting up a system of scanning and storing new material. This should result eventually in an electronic library available to all members. 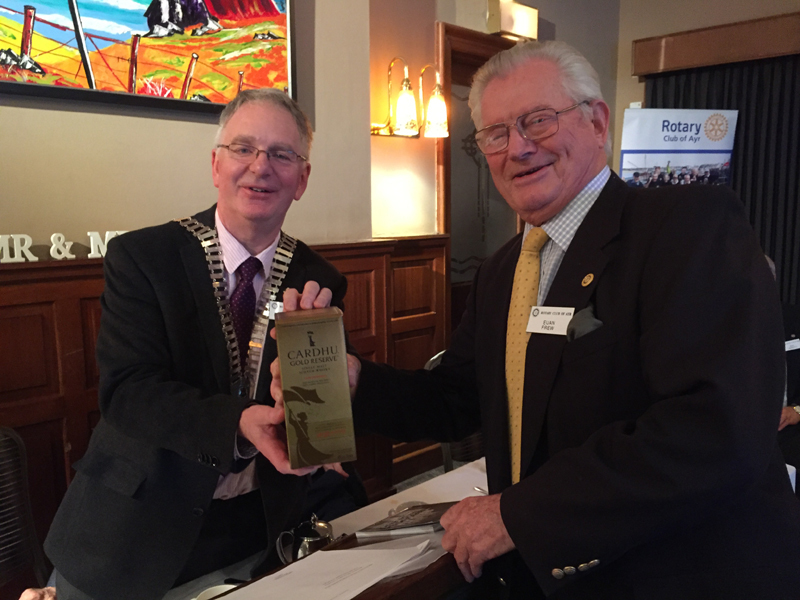 At our recent SGM President Craig formally acknowledged Euan’s significant contribution to the club’s history and thanked him on behalf of the members by presenting him with an excellent bottle of malt whisky. However, a rather downbeat postscript is necessary: according to Euan the volume of material he has been receiving for archiving has been steadily diminishing which means that much of interest about the club’s activities is lost to history. He has made a plea (principally to convenors but not exclusively so) for relevant material to be submitted to Hugh in future.